Searching for a great value on medical device products? 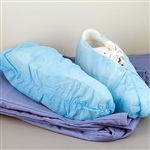 We stock supplies equipment from top brands in every specialty, including Sklar Shoe Covers - Large (Case Of 300), all at great prices. At Medical Device Depot, we offer quality medical equipment for physicians and health care professionals at the lowest possible cost. You can contact us anytime at 877-646-3300 or via our live chat widget on medicaldevicedepot.com. You can also join our mailing list here. You can always visit the 'My Account / Order Status' link at the top right hand side of our site to view orders you have placed, change or cancel an unprocessed order, track your shipping and more.We accept all major credit cards and can also accommodate purchase orders from large institutions. Purchase orders may be faxed to 410-505-4567. Looking to lease instead of buy? Most of our products offer a lease application right on the product page - you can conserve your working capital and get tax deductions for all your medical device needs. All sensitive/credit information you supply is transmitted via Secure Socket Layer (SSL) technology and then encrypted into our databases and accessible only by those professionals with rights to the server.